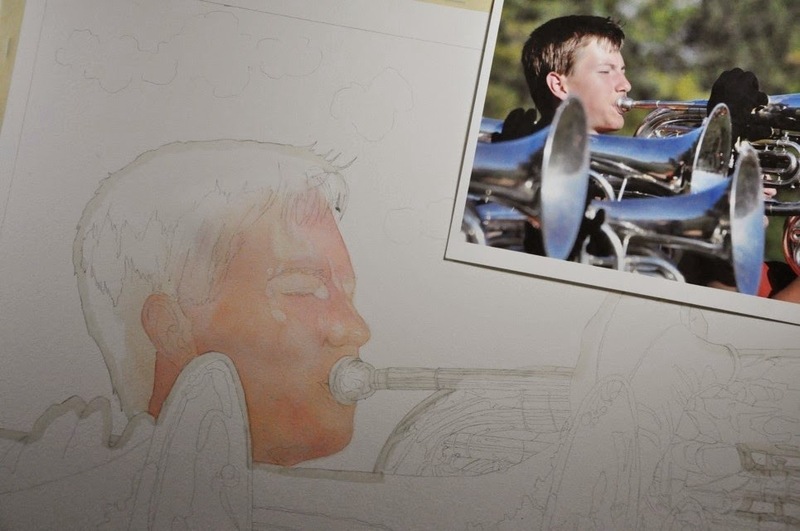 I started my new band painting yesterday. This one is of my son and the baritone section for marching band. Because he is so tall I got a shot of him above the other baritones and thought it would be a wonderful painting. I really liked the blurry green trees in the background and the reflections of sky and orange from their shirts in the instruments. I plan on playing up these colors, so they will really grab attention. 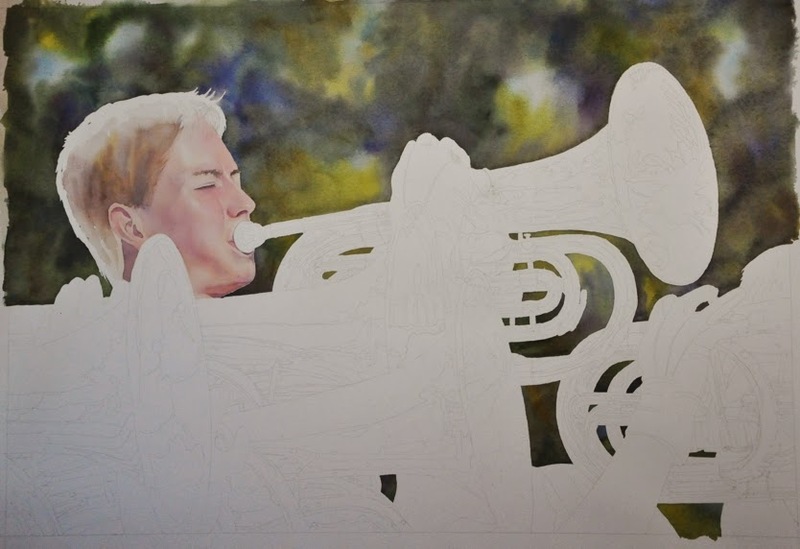 I started the painting by masking around the edges of the instruments and my sons face in preparation to paint the background. Then I remembered that I wanted to start with his face and had to remove a little masking. The reason I started with his face was to see if I could getting it looking the way I wanted before moving on. If the face wasn't turning out right, then I could start the painting again and I wouldn't have invested a lot of time into it, yet. I worked his face in layers. The first washes were done with a warm red and yellow to give the skin a warm glow. Then I started layering on washes of permanent rose and a yellow or alizeran and burnt sienna. These are cooler reds and I could start modeling the skin. I also used some ultramarine blue and alizeran for shadows. I always layer skin in thin washes until I have it where I want it. But, don't hesitate to go dark with shadows. I may still had some to his face once I have more paint on the rest of the scene to judge my values by. 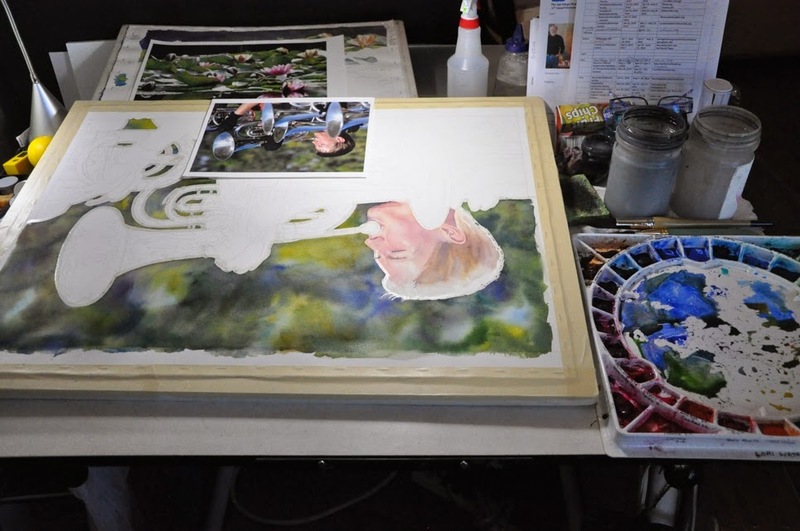 The next step was to paint some masking back around the edge of his face so that I could do a wet-n-wet wash on the background trees. I wanted them to be blurry color. After the masking was dry I painted water several times over the whole background green large area. Before I did this, I had what ever colors I thought I might use out on my palette ready to go. I tried to vary the colors in the trees without getting too crazy and I left some areas that look like the sky was peeking through. I let this dry over night and realized that part of the background needed a little darker value. So, I turned my painting upside down and very gently washed water over the part of the background that I wanted to adjust and added some deeper color. Sounds like you really know how to do skin tones, which is something I've never tried. The backgrounds always scare me...never know how to approach them. I hesitate rewetting a smaller spot within a painted area fearing it will leave an undesirable line. How do you avoid that? Thanks for sharing your process! Hi Johanna. I started painting figures after I got the book, "Painting Watercolor Portraits that Glow" by Jan Kuntz. I use a lot of her layering techniques. I always try to put the background in the first time because it will be fresher. In this case, I needed to darken an area. So, I wet an area that is much larger than the area I wanted to adjust. If the paint moves to much and starts to leave an edge, then I just add clear water and make the wet area even larger. I also had my soft mop brush ready to feather out edges in case something did start to create a line. Thanks for explaining. I lose a lot of "freshness" because I work over areas too much. I also find that, if I do not wet an entire area, it will always leave a watermark, especially if the paint is already heavy in that area. Somehow, the mop idea had occurred to me recently. Thanks for sharing that...will try it. Lovely start! Thank you for sharing. I have a question about your drawing. Did you hand draw the photo, use a grid from the photo, or did you use a projector and trace the photo? 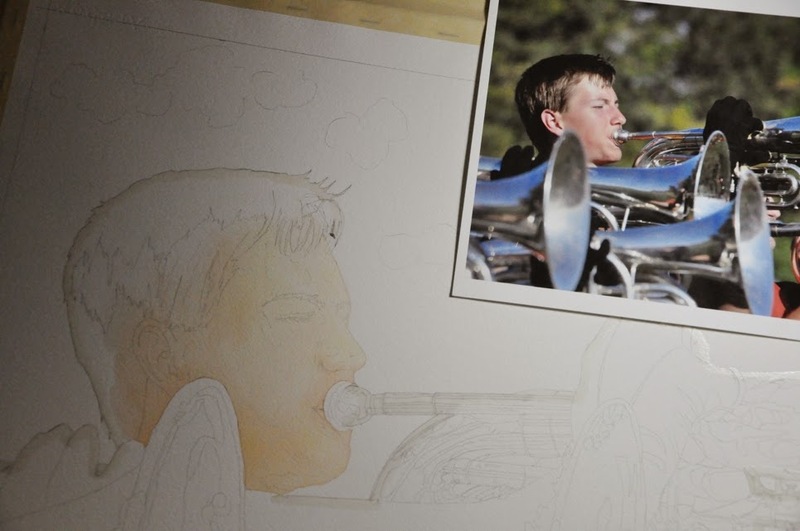 Your work is so photo realistic, so want to know your process of getting a drawing down on your paper. Thank you! Hi Karen, For this painting, I used a grid on my photo. I used a 1/2 grid on the photo and a 1" grid on my drawing paper. Then once my drawing (14"x21") was done , I used a waterproof black, ink pen and drew over all the lines so that I could take it to Kinko's and enlarge it to the full paper size (19"x28"). I used a proportion wheel to figure out what size it would need to be enlarged to. Then I use my light table to transfer the image to my watercolor paper. If you don't have a light table, you can use a window and the bright sunlight.